Whether you're looking for a hostel bed, a 5* hotel room or anything in between, we cater for all your accommodation needs with flats and apartments, B&Bs, hotel rooms, houseboats and rooms for daily, weekly and monthly rental. 2, No 100% upfront payment (unless you wish to pay in advance). 3, No Airbnb type service fees to guests so the average saving is 13% on every booking. 4, Unlike some of the bigger operators we have no sneaky extras. The rate you see is the rate you pay. Call us, use our live chat system or drop us an e-mail, we are on hand to help. We know the majority of properties, and the images are all verified by us, so you know that what you see is what you get. Many of our customers return to us time and again. Once you stay with AmsterdamStay you won't want to stay with anyone else. All budgets and group sizes are catered for with our unique collection of short stay, self-catering apartments, condos and long-term rentals providing convenience, space and privacy. Check out our Cheap as Chips apartments all under Euro 100 a night. We offer a huge selection of smoking apartments/cannabis weed friendly as well as many non-smoking apartments. Planning a last minute trip? Check our last minute rates and discounts, and grab some real bargains. Having trouble finding the perfect place to stay? If you need help finding your dream accommodation we are here to assist. Our team know the properties and they know Amsterdam so they can answer any questions you have. AmsterdamStay is all about happy guests, so finding you accommodation meeting your specific needs is our mission. We do not just sell you any old apartment just to get the commission. We want to sell you the right place in the right location that caters for all your needs. ''Thank you for the rapid reply: You guys are the best, and I've been telling all my friends about how great you guys are, hope you don't mind. ''I just wanted to thank you all for arranging the Damrak apartment for us. Everything worked out perfectly, and we had a very good time while in Amsterdam! We will certainly refer any of our friends travelling to Amsterdam to stay with you guys. ''Just wanted to say thanks and that we enjoyed the comfort and amenities of the Apartment and the location was perfect just off Nieuwmarkt Square. We did leave one trash bag out on the patio, as advised. I now see why your trip advisor reviews are so good, and we look forward to a return stay. 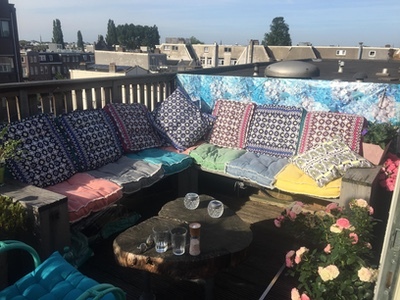 "Our Amsterdam pad booked with AmsterdamStay was great and from my point of view renting an apartment, it's a good way to do things inside the flat, watching Willy Wonka movie and enjoy the freedom even when the weather outside is cold and rainy. Have a good one from Marco ed Amici"
Fancy a stay on with a difference? Fancy a stay on the water? 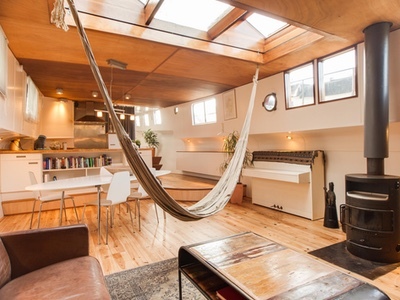 Well, check out our Amsterdam Houseboats, offering groups and couples some lovely places to stay and a real difference to staying in Amsterdam on dry land. Staying on a houseboat is different from staying in an apartment in many ways, and if you have not tried it yet, this could be your chance. We have some real romantic for couples and larger ones for groups. For larger groups of up to 25 guests, we can offer several sailing ships like Amsterdam Ark for looking to stay on a budget. 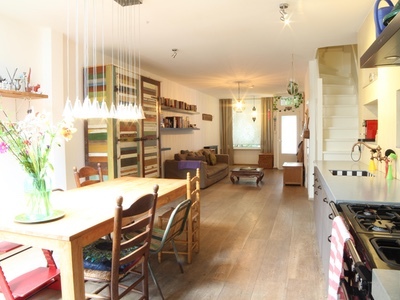 Check out our new Luxury apartments in Amsterdam for guests looking for a little luxury during their stay. We offer a vast collection of apartments that cater for all budgets and group sizes. 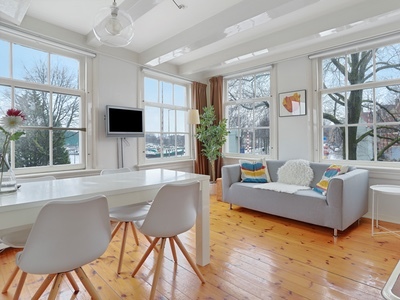 Whether you want accommodation in one of the lively tourist spots of the city, overlooking one of the famous canals or in a more family-friendly location like Vondelpark, we can offer you some lovely places. Unlike most, if not all other companies, we visit all the accommodation provided on our site and even take the photos, so you can rest assured that what you book is what you will get. Nieuwmarkt, Under ten minutes, walk from Central station it's a cool square with many coffeeshops and bars, A real chilled area. The red-Light district is located just off Nieuwmarkt. Dam Square Under ten minutes, walk from Nieuwmarkt square and central station. 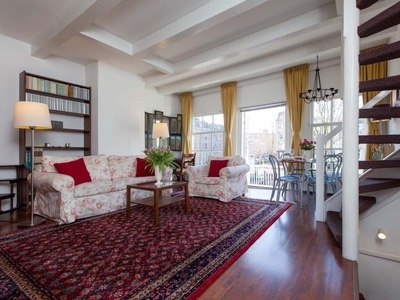 If you are looking for a quieter location the Jordaan is a great choice. For visitors looking to stroll along the canals check our canal listings. Whatever your location we have places for your stay. AmsterdamStay, the experts when it comes to group accommodation in Amsterdam. We cater for all types of groups from stag and hen parties, friend get-togethers, large family groups or other large groups staying on business or pleasure. We have many options from multiple apartments in the same building to sailing ships and Houseboats, which are ideal for large groups on a budget. New places are listed almost daily, here are a few of our latest arrivals Dam Square Apartments | Nic's Houseboat others are arriving on a daily basis. 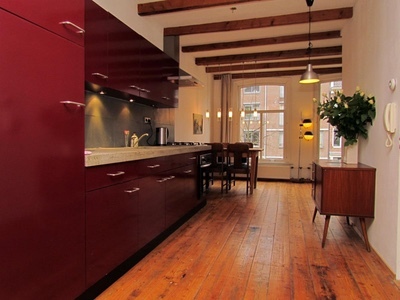 We offer great a great collection of rentals and places to stay in and around Amsterdam. Want local information about the city? Visit our City Guide for useful information, ideas on things to do and see when you are here, news on what's happening in the city and lots more. Smoker friendly Amsterdam apartments where smoking is allowed. If you like to smoke during your stay and are seeking smoker allowed apartments for your stay then click here for smoking allowed properties in Amsterdam from the AmsterdamStay collection of vacation places.